WWI Profile: Elijah Milliken 1896-1918 | Friends of Fort Caswell Rifle Range, Inc. According to Elijah Milliken’s NC WWI Service Card, he was born in Southport, NC, on August 30, 1896. The 1900 Census and 1910 Census show him living in Shallotte, the oldest son of Robert and Mary Milliken. His father Robert was a farmer. When the first draft registration was held for WWI on June 5, 1917, it was required for men between the ages of 21 and 31. Elijah was not yet 21. A city directory from Wilmington, NC, [Source: Ancestry] has a listing for Elijah Milliken as a clerk, living at 1810 Castle, along with Bruce, mill hand, and Robert L. This is very likely Elijah and his brother, Robert Bruce, and father Robert. The building at 1810 Castle St in Wilmington is a low brick building built in 1900. [Source: New Hanover Count Tax Records] It still exists today, although it’s no longer residential. You can see it on Google street view here. An advertisement from the October 3, 1915, issue of The Wilmington Morning Star lists the residence at 1810 Castle for rent, 5 rooms. They weren’t listed in the 1918 city directory, but as shown below, in 1918 Elijah and his father were in Rocky Mount working at a mill there. When the second draft registration was held on June 5, 1918, to include males who were 18 years and older, Elijah registered. At that time, Elijah was single and working at the Rocky Mount Mills. He listed his nearest relative as his father at Rocky Mount Mills. Elijah was ordered to report for military duty on August 5, 1918 [Source: Ancestry] in Nash County, and sent to Camp Wadsworth, SC. He joined others from Brunswick County assigned to 55th Pioneer Infantry, as described in Kendrick Outlaw’s WWI Profile. The Companies the soldiers were assigned seem to have changed often. Below is a photograph for Company D, which is the company referenced as Pvt Millken’s in the Mother’s Pilgrimage document near the end of this profile. He and the other Brunswick County soldiers may or may not be included in the photograph. Pvt Milliken and all of the Brunswick County soldiers in the 55th Pioneer Infantry left for France on September 15, 1918. Pvt Elijah Milliken passed away from pneumonia on December 11, 1918. His final three months are difficult to determine. No documents were found describing operations of the 55th Pioneer Infantry, possibly because they were created specifically to assist in combat or engineering work as needed. Using the NC WWI Service Cards from Brunswick County 55th Pioneer Infantry soldiers shown in Pvt Kendrick Outlaw’s WWI Profile (also located on the World War I Army/Marine Division Roster webpage), many of the soldiers from the 55th Pioneer Infantry were transferred to the 81st Division on November 1, 1918, whose operations are covered around that time beginning with Willie Hasper Hewett’s WWI Profile. Pvt Milliken’s NC WWI Service Card has no information regarding whether he served in combat or remained ill for several months before succumbing to pneumonia. By the 1920 Census, the family had returned to Shallotte. Source: Sewell, Patricia and Cecilia Palin, eds.. U.S. World War I Mothers’ Pilgrimage, 1929 [database on-line]. Provo, UT, USA: Ancestry.com Operations Inc, 1999. Elijah’s mother, Mrs. Mary Elizabeth Milliken, was given the opportunity to take a Mother’s Pilgrimage in 1929 to visit his gravesite. All three mothers listed from Brunswick County declined. 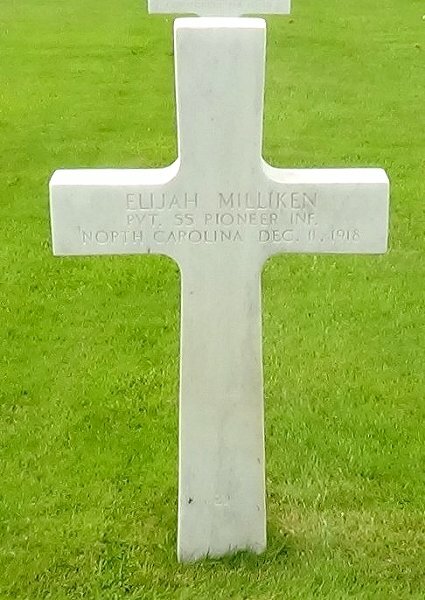 Pvt Elijah Milliken was laid to rest in Saint Mihiel American Cemetery and Memorial in Lorraine, France.